Everybody has their own preference when it comes to the kind of Christmas tree they want to have in their home to put the finishing touches on the festive season. Some people prefer a "real" or live Christmas tree for a variety of reasons, while others prefer an artificial tree. This article takes a look at the latter choice and the several benefits that owning one of these trees has over its major counterpart. There is no doubt that probably the most obvious benefit of owning an artificial tree over a real one is the fact that you can use it year after year. As long as it is looked after well, it can last for many years and keep its great shape and good looks. As long as you have some place suitable to store it for the rest of the year, then this is a benefit few can ignore. But aside from that major glaringly obvious advantage that an artificial tree has over a live one, what other benefits can be had from ownership of one of the new breed of high quality, realistic looking trees bring its owner? These represent the main benefits over real trees at Christmas. There are many more minor ones, but we've kept things as concise as possible here. The bottom line is that once you have purchased your artificial Christmas tree, you will be able to enjoy it year after year and not have the worry of having to go look for a new tree every time during the colder part of the year in the mad rush when everyone else has the same idea! There is a massive variety of the types of tree that you can buy for your home. They range from the more general realistic looking trees that emulate their real counterparts very well, to the more unusual kinds. You can take a look around and find yourself coming face to face with some really interesting varieties of tree. This is something that more and more people are switching to as a way of doing something different from their friends, family and neighbors. You can buy trees in a variety of colors, not just a few shades of green! How about a striking red tree, or a cool white one? What about a deep blue or even a black tree? You can get them and many more too. 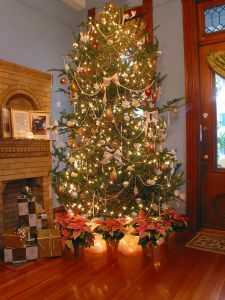 There are some really unique artificial Christmas trees available especially from online vendors who can carry a really wide selection of trees. If you live in a small apartment or house with small rooms, you might find that you are too short of space for a regular sized tree, but you can still fully enjoy the visual benefits of one of the many slim artificial Christmas trees that you can now get, also in a range of colors. The time you save by not having to go out into the cold in search of the perfect tree for each subsequent festive season can be spent in the comfort of your own warm home taking your tree out of its box, erecting it and decorating it. And you'll still have ample time to then sit back in an easy chair with a nice glass of mulled wine or eggnog to admire your handiwork! So raise your glass to a great decision to opt for an artificial tree this Christmas, which will see you happily through many more Christmases to come.